Free download Spy Pigeon Bird Shooting for Android with APK file. Download Spy Pigeon Bird Shooting new version from the direct link. 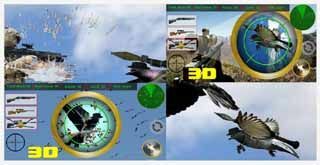 Spy Pigeon Bird Shooting is great fun and bird shooting game with sniper gun. Pigeon is flying on border area on spy mission. having some spy wear so find exact spies and soot them before it poop on your screen reduce your gunner health. Excellent FPS (First Person Shooting) game have real like environment to enjoy the game. flying pigeon birds. Naughty birds use pooping to hurt, resulting player health reduce, find them and get down quickly. This is endless pigeon shooting game to get more score to compete friends score and all the game users. Top scorer will be at top of the leader board. so keep playing for show you at leader of the game. Touch and drag screen to move around sniper gun for get target under cursor . User Shoot button to get bullet fire at right bottom of your mobile screen. Sniper scoop button use to closer the target pigeon close at right. Keep watching on radar at top right for find pigeon movement and location.